Kwan Phayao, or Phayao Lake, covers around 20 square kilometres and was formed by the creation of a dam by Thailand’s Fisheries Department in 1941. Browse places to stay in Phayao on Booking.com. Book Now - Pay Only When You Stay. Prior to the dam’s construction the area was filled by a number of smaller lakes and swamps, with their levels changing seasonally with the rains. 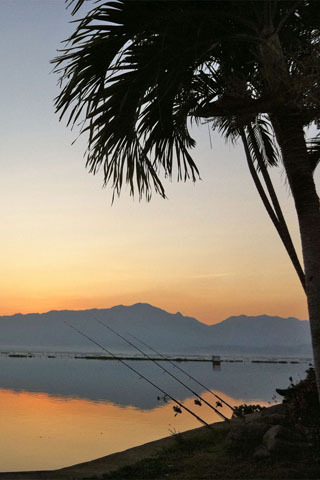 Today Phayao Lake is a very popular spot with local tourists and is also an important fishing resource. Wander down to its banks in the early morning and you’ll see fishermen heading out while by mid-morning the lakeside restaurants will be setting up for another day of drinking and eating including of course, grilled lake fish. The lake-side is a popular recreational area with; afternoon aerobics and keep fit classes, picnicking families, strolling couples and evening eating and drinking going on all along the promenade and adjacent cafes and restaurants. Hire a boat to coast out onto the waters to Wat Tilokarum in the late afternoon, rent a bicycle and ride around the lake or sit in the park and catch the photographic sunset views; wonderful! Browse our independent reviews of places to stay in and around Phayao. Read up on where to eat on Phayao. Check out our listings of things to do in and around Phayao. Read up on how to get to Phayao, or book your transport online with 12Go Asia. Planning on riding a scooter in Phayao? Please read this. See below for more sights and activities in Phayao that are listed on Travelfish.org. Where are you planning on heading to after Phayao? Here are some spots commonly visited from here, or click here to see a full destination list for Thailand.